The Yas Marina Circuit is basically the venue for the Abu Dhabi Grand Prix. 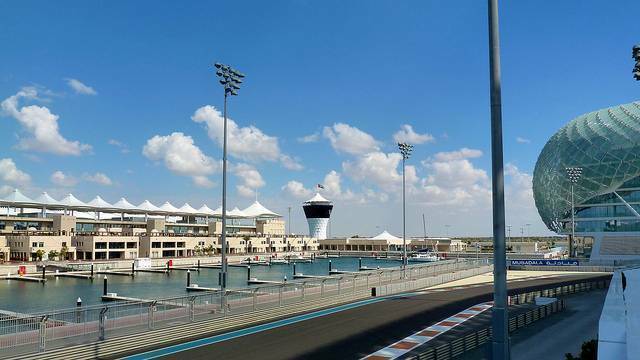 It is located on the Yas Island, which is situated around 30 minutes from the main city of Abu Dhabi. It is one of the two Formula One tracks in the Middle East and hence is very popular among the tourists and the residents alike. It is a perfecto place for the thrill seekers to feel like a champion at this circuit. This place offers drifting, spinning, drag racing to kid’s driving lessons making you the person in control and providing an unforgettable experience. It also includes a theme park, a water park, residential areas, hotels and of course, beaches! If you are a motorsport fan, you have to definitely book a track and have an amazing experience. A series of track day packages are available here like the “Drivers experiences”, “Passengers experiences”, “Private driving tuition programs” and “Racing Licence Courses”. Master the corners of the Formula One circuit and compete with the wind. There are on board a camera that capture all the action and preserves the incredible memory for you. Whether you are a driver or a spectator, the visit to Yas Marina Circuit is sure to be a once-in-a-lifetime experience for you!